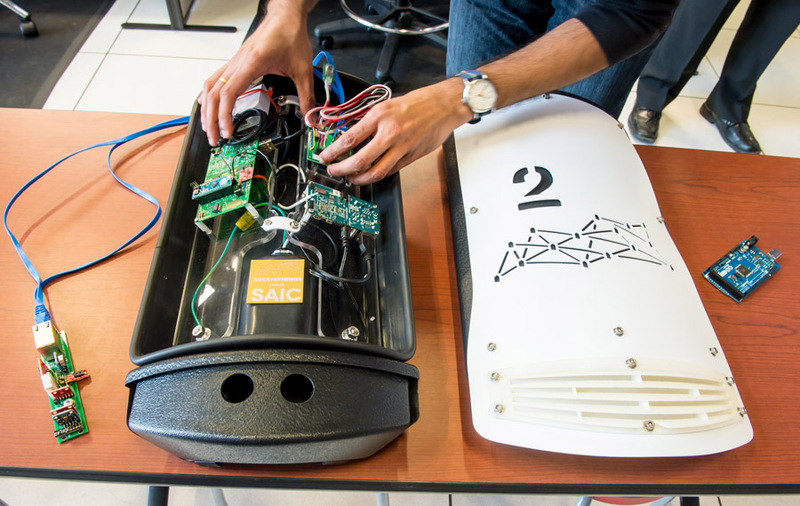 The Array of Things (AoT) is research project to deploy hundreds of interactive, modular sensor boxes around Chicago collecting real-time data on the city’s environment, infrastructure, and activity for research and public use. The project is led by Charlie Catlett, from the Urban Center for Computation and Data. The Array of Things website has a detailed description of the project with loads of pictures. You can also read more about AoT in some of the news stories already written about the effort at Bloomberg View, Chicago Magazine, USA Today, the Chicago Sun-Times, and E+D Magazine, or watch a video on the project from WIRED. The AoT combines the Waggle technology developed at Argonne National Laboratory with the architecture, design, and artistic skills of the School of the Art Institute of Chicago (SAIC). One of the early design prototypes (Serial Number 2 :-), from SAIC, is shown below outfitted with Waggle.